Happy Friday! Even happier Friday to those of you who are celebrating Labor Day weekend! I am ready for a three day weekend, I have a to do list of fun projects that I haven't had time to do all summer, and I'm looking forward to getting it all done. This week I've spent a lot of time talking about assessments and portfolios to help you get some systems in place. Up to this point I've talked about the work that you can do to begin preparing portfolio systems, this freebie is something you can use to encourage children to take an active role in compiling their portfolios. Make multiple copies of these Student Selected Evidence Tags and keep them on hand. 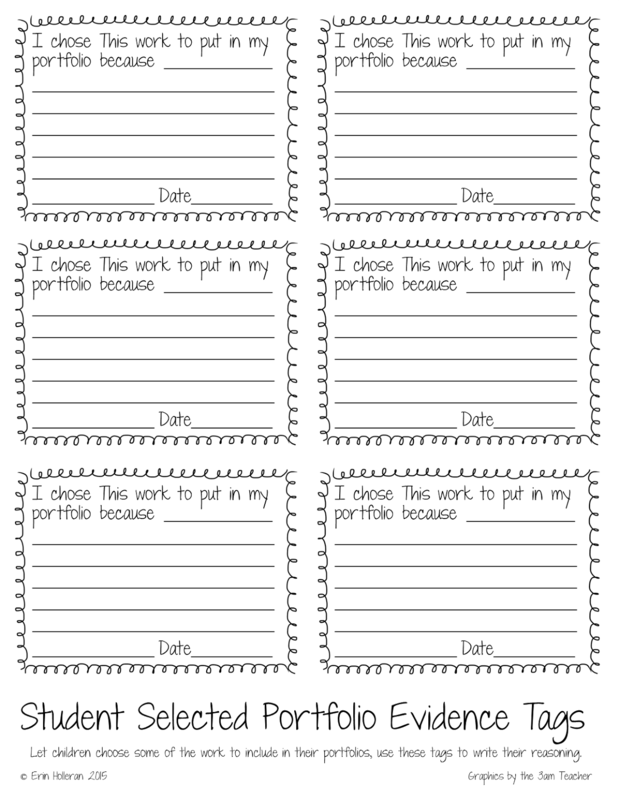 When a child completes a piece of work that he or she would like to include in their portfolio you can write down why they chose that piece of work to include in their portfolio and attach the tag to the back of the work. Children will love that they get to help choose their best work to showcase in their portfolios!